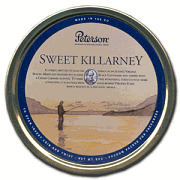 The following is a review of Peterson's Sweet Killarney I did on 2/27/06. A unique mixture of selected tobaccos including Virginia Burley and Maryland leaf with some Black Cavendish and topped with a cream Caramel flavor. To make this wonderful tobacco even more attractive, it is blended with hand-rubbed Virginia flake which results in a fantastic aroma. Sweet Killarney - Raisins a blaze! I love the various cuts in this mixture, made it rather interesting but the tastes are a little too much for me, smelt like melting raisins. No doubt a quality weed just not for me. I will smoke up what I have and am thankful, as it was a gift just nothing I see myself purchasing anytime soon.